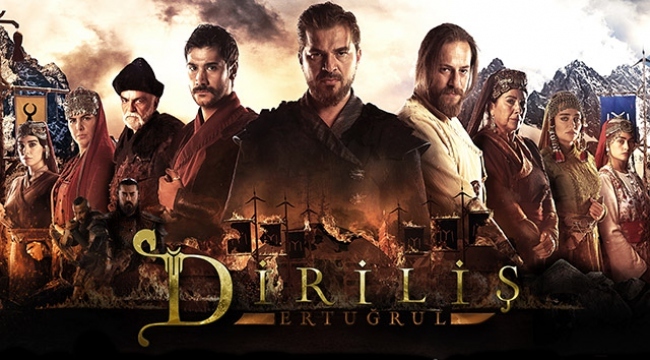 Diriliş: Ertuğrul… Another Legendary Historical TV Series | Do You Know Turkey | Turkish Tv Series & Drama, Turkish celebrities, travel information about Turkey and Turkish cusine. Historical tv series are on demand. “Diriliş: Ertuğrul (Resurrection: Ertugrul)” is not a new tv series, its third season is on air now. But the thing with this series is it already proved its quality and popularity. When it is compared to “Magnificent Century”, we may say that the main difference is Magnificent Century was based on a love story, the mighty Sultan Suleiman and the political side of Ottoman Empire was on the second plan. Whereas Diriliş: Ertuğrul is based on the historical foundation of Ottoman Empire and focused on more action scenes. This makes the series more attractive for who enjoys fighting scenes. Another reason of the success of the series is of course the cast, Engin Altan Düzyatan is starring on the series as “Ertuğrul Ghazi” the leader of Kayı Klan. Engin Altan Düzyatan considered to be one of the best looking actors of Turkey and he also has good acting skills. The third season of the series is broadcasting now. The producers say making a historical tv series and trying to keep away it from the fiction is very hard. They continiously do research and take advice from histiorians. Besides, Diriliş Ertuğrul is not a boring documentary, it is full of action. Kayı Tribe, the roots of the Ottoman Dynasty is a nomad and warrior tribe, and 13th century’s Anatolia was a battlezone. Kayı Tribe is on of the Turkic tribes who fleed from central Asia after the Mongol Hordes began its dreadful march. Kayı Tribe’s journey through Anatolia was really hard, all the troubles of the migration plus famines and confilcts. Süleyman Şah the aged leader of the tribe has two sons as heir, Gündoğdu and Ertuğrul. But it wont be easy for Ertuğrul to be the heir, he should earn it and must be accepted by the lords of the clan. When Kayı’s arrived to Anatolia, The Great Seljuk Empire has already collapsed and seperated to smaller Seljuk States, Mongol invasion was still ongoing, Byzantium Empire and Crusader remnats exists and also Knights of the Templar’s secret existance was a threat too. Ertuğrul is a young man and he knew that he should lead the tribe to survive. He managed it and take this small clan to become the roots of the Ottoman Emipre. In history, he managed it, move the Kayi Clan to Bursa and his son Osman Bey declared Ottoman Beylik which was transformed into a transcontinental empire. We can call Ertuğrul as the grandfather of the Ottomans. Ottoman Empire was a Turkish İslamic empire, established after the collapse of Anatolian Seljuk State. Seljuk Empire reached from Central Asia to Anatolia, Ottoman’s took the step further to the gates of Vienna on west, Morocco in Africa, Egypt, Arabic peninsula and Ukraine. The success of the Ottoman Empire was the principles of their grandfather Ertuğrul and his teacher and adviser Skeikh Edebali who’s famous word is “Let live the people that the state could live” which is followed by all sultans for 600 years. The second child of Süleiman Shah. He has the soul of a leader since his childhood. Ertuğrul is a brave and wise person, also he is a great warrior. Ertuğrul is in a pursuit of catching his dreams, and he can fight for his ideas he can face with death anytime regardless of having fear, he is also judicious man so his followers believes to him and they can sacrifice their lifes for their young leader, Ertuğrul. Hülya Darcan Hayme Hatun Mother of Ertuğrul and Gündoğdu. Wife of Suleyman Shah and grandmother of Osman I.
Kaan Taşaner Gündoğdu Ambitious son of Suleyman Shah and older brother of Ertuğrul. Barış Bağcı Noyan One of the Commanders of the Mongols. Hüseyin Özay Korkut Bey Leader of the Dodurga tribe and older brother of Hayme Hatun. Uğur Güneş Tuğtekin Son of Korkut Bey. Commander of the Dodurga tribe and cousin of Ertuğrul and Gündoğdu. Kaptan Gürman Geyikli Lives in the forest. Helps Ertuğrul on his quest. Osman Soykut Ibn Arabi Andalusian Sufi mystic and spiritual leader of the East. Helps Ertuğrul and his friends. Serdar Gökhan Suleyman Shah Leader of the Kayi tribe and father of Ertuğrul and Gündoğdu, grandfather of Osman I.
Cengiz Coşkun Turgut Alp Loyal war friend of Ertuğrul and best friends with Bamsi Beyrek and Doğan Bey. Hande Subaşı Aykız Wife of Turgut Alp and spiritual daughter of Hayme Hatun. Didem Balçın Selcan Hatun Wife of Gündoğdu and daughter in law of Hayme Hatun and Suleyman Shah. Burcu Kıratlı Gökçe Little sister of Selcan Hatun. She has feelings for Ertuğrul. Eren Sakcı Efrasiyab Iranian merchant. Cooperating with Noyan. Mehmet Çevik Deli Demir The blacksmith of the tribe. Good friends and loyal to Suleyman Shah. Has a strong personality. Hakan Vanlı Kurdoğlu Swore Brother of Suleyman Shah and leader of many nomad families of the Kayi tribe. Has a hidden agenda. Celal Al Abdurrahman Loyal war friend of Ertuğrul. Special commander of Hayme Hatun and good friends with Turgut Alp, Doğan Bey and Bamsi Beyrek. Nurettin Sönmez Bamsi Beyrek Loyal war friend of Ertuğrul and best friends with Turgut Alp and Doğan Bey. Cavit Çetin Güner Doğan Bey Loyal war friend of Ertuğrul and best friends with Turgut Alp and Bamsi Beyrek. Turgut Tunçalp Afşin Bey Loyal Commander of the Seljuk Empire. Sedat Savtak Shahzade Numan Banned and exiled prince of the Seljuk Empire. Father of Halime Hatun. Levent Öktem Üstad-ı Azam Knights Templar Grand Vizier of the Order Council. His main purpose is to perish the Muslims and take back Jeruzalem. Serdar Deniz Titus Commander of Knights Templar. Seeking revenge to kill Ertuğrul for killing his little brother. Burak Temiz Shahzade Yiğit Son of Shahzade Numan and little brother of Halime Hatun. Mehmet Emin Inci Emir El-Aziz The Sultan of Aleppo. Gökhan Atalay Şahabettin The uncle of Sultan El-Aziz. Hamit Demir Akçakoca Leader of some of the nomad families of the Kayi tribe and friend of Suleyman Shah. Reshad Strik Claudius (Ömer) A great Knight that was assigned to assassin Ibn Arabi only to become his pupil and later saves Ertuğrul’s life. Fahri Öztezcan Ilyas Fakih Apprentice of Ibn Arabi and friend of Ertuğrul. Diriliş Ertuğrul (Resurrection: Ertuğrul) 64th episode was aired as of today and the series in its 3rd season . According to the historical orders, we think that there will be more than 10 seasons of the series until the establishment of Ottoman Beylik which will transform to Ottoman Empire.The original series is aired on Wednesdays at 20:00 in İstanbul time on TRT 1. Amazing series of historical facts in you can’t stop watching once you started. To me Ertugral Gazi has laid the groundwork of the great Ottoman Empire. I found this series by accident on Netflix. Fell absolutely in Love with it. The quality of acting; Engin Altan Düzyatan, his superior acting skills are off the hook! Amazing!! He better be nominated for more then 1 Award in this series. He gives Leonardo Dicaprio a run for his money. His emotion is so amazing, authentic, I feel it with him. I can’t get enough. At the same time, it has totally opened my eyes and peaked my interest in Turkey. I am looking up & reading alot about the cultured, the history , the religion of Turkey. I am absolutely enthralled over this series. It has put Turkey on my Bucket list, for sure. Thank you for creating this series..!!!!! Like others, my family and I came across this series accidentally on Netflix, and we are truly glad we did. I m history buff especially from the 1100 thru the 1400’s and this really sparked an interest in the Ottoman empire. I would guess that most people who love this series are of Turkish descent or of the Muslim faith, we are American born roman Catholics of Italian descent. Regardless, the series has made me really interested in the Turkish history and the Islamic faith (that we here in America have never been taught about except the bad). The series has really opened my eyes. Thank You for the prospective of the Turkish people and their history. It’s a shame I can no longer access this drama on Netflix one of the best dramas I have come accross. Like the rest it sparked into flame an interest in the untold story of the Middle East. Is there a site I can continue to watch this drama with subtitles apart from Netflix. I started watching it from netflix also, and Loved it. Do we ever find out what happens to Gundogdu and his tribe? What exactly killed Suleiman Shah in the series….was it cancer on his back? It was referred to as a boil, but since it ended up covering his whole back, it sounded more like a cancerous growth.